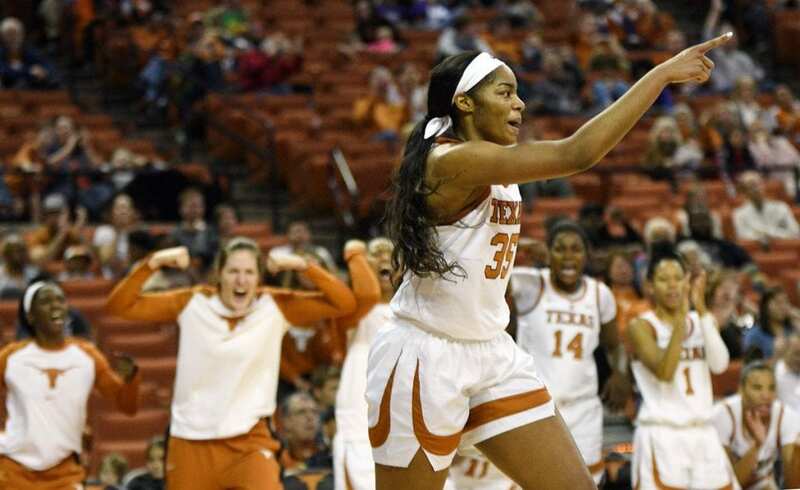 Texas was fired up as it beat visiting Stetson Sunday at the Frank Erwin Center to improve to 8-1 (Photo courtesy of Texas Sports). AUSTIN, Texas — Texas took one quarter to get in gear, but from there the Longhorns ran away from visiting Stetson in a 65-46 win Sunday afternoon. 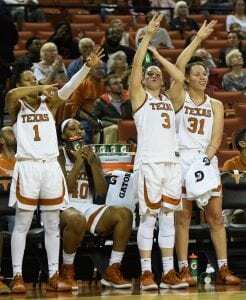 Danni Williams, Charli Collier and Destiny Littleton all reached double figures for the Texas Women’s Basketball team (8-1) as a balanced attack helped the ‘Horns pull out to a comfortable lead and win. The game was tied 13-13 after the first quarter, then No. 12 Texas took the game with a 14-6 advantage in the second quarter for a 27-19 halftime lead. It was 44-32 heading into the final frame, where Texas put up 21 points to solidify the big home win. The shots were falling in the second half as No. 12 Texas ran away from visiting Stetson (Photo courtesy of Texas Sports). Williams led the way with 15 points and eight rebounds, and Collier came off the bench for 13 points and six boards — including going 7-for-7 from the charity stripe. Littleton notched 10 points, four rebounds and two steals, with Jatarie White finishing with eight points and seven boards. Point guard Sug Sutton’s smart yet aggressive play led to a career-high five steals in the win, to go with four points, three assists and three rebounds in a solid all-around game. Audrey Warren also contributed to the win once again with seven points, five boards and three assists. Junior Joyner Holmes made her second appearance of the season, notching her first start of the 2018-19 campaign as she settles back in after injury. She finished with six points and six rebounds for the Longhorns. Texas plays UTRGV Thursday, Dec. 20 on the road in Edinburg, Texas with tip set for 7 p.m.